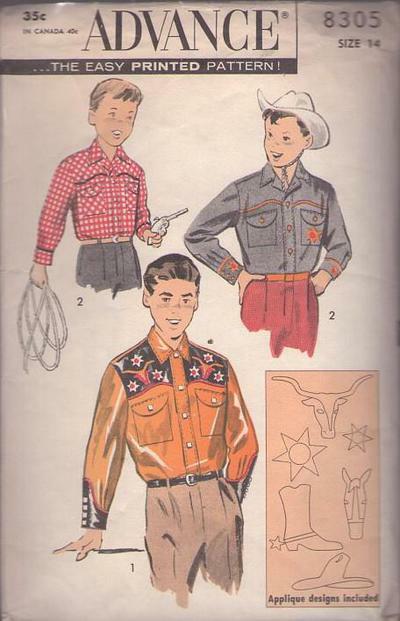 1957, 50s Western, Retro VLV Cowboy Clothing Patterns - Boy's Western Shirt. Applique Designs Included. Western Sports Shirt - Hammer-on snap fasteners or buttons and button-holes for closings. Shaped yokes front and back - optional corded piping trim. Convertible collar, applied front band - patch pockets. Set-in sleeves with deep shaped cuffs (V1) or (V2) Regulation shirt sleeves with three-buttoned cuff. Applique designs included - see the special insert for ideas for trimming and decorating.